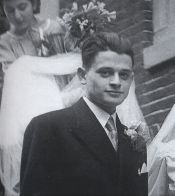 Jules Schelvis (Amsterdam 7 January 1921; † Amstelveen 3 April 2016) was put on transport from Westerbork on 1 June 1943 with his wife and in-laws. He brought his guitar as a ‘welcome distraction to take our mind off things’. On arrival in Sobibor he managed at the last moment to join a group of men who were selected for labour in the peat camp of Dorohucza. Jules Schelvis was one of the eighteen Dutch Jews who survived Sobibor. "before I knew it the women were separated from the men"
On 26 May 1943 there was a raid in the city centre of Amsterdam in which more than 3,000 Jews were rounded up. Among them was 22 year old typographer Jules Schelvis, his wife Chel and her family. The couple had considered going into hiding, but had dreaded the problems this would present. Like so many others they expected to be put to work in German camps and they had decided to let themselves be rounded up. ‘Very calmly,’ wrote Schelvis after the war ‘we got our rucksacks and haversacks, that had been long ready just in case.’ By tram they were taken to a site near Muiderpoort train station, and from there, after hours of waiting, transported on a special train to Westerbork on June 1st. After six days they left the barracks with bag and baggage and were put on a train to Sobibor. After four days the victims arrived at the camp. The reception did not bode well. They were beaten out of the carriages by men with truncheons and whips. ‘I remember very well’, said Schelvis, ‘how my father-in-law was struck very hard across his back with a whip’. The prisoners had to walk towards a large barracks and throw all the haversacks and rucksacks, coats and overcoats on big heaps. ‘Before I knew it the women were separated from the men. I didn’t even have a chance to kiss Chel and we weren’t allowed to look back’. Schelvis never saw his wife again. "emaciated people with death in their shoes passed us"
From among the men a group of eighty young men were selected for, so it seemed, the Jewish camp police and Schelvis managed to get included in the group. As it turned out the men were chosen to work in a nearby camp. An SS-officer told them they could return to their family and friends in Sobibor every night, to eat and relax. Those who stayed behind in the camp, so they were told, would first bathe. Separately of course, as that is why the men and women had been kept apart. Later, when Schelvis was put to work in Radom, he was told exactly what had happened to those who stayed behind. After the men and women had undressed, they were led to special chambers where they were gassed. After that their corpses were checked for gold teeth; these were knocked from their mouths by members of a Jewish Arbeitskommando. After that the corpses were dragged to the crematorium and burned. Schelvis and the other young men were moved to labour camp Dorohucza, a peat camp where conditions were abominable. Prisoners slept in a draughty barracks, on the floor, no blanket. The Poles and Dutchmen who had been here longer were covered in lice. As there was no place to wash, the prisoners washed themselves in the creek in the morning. The work consisted of cutting peat. In the afternoon everyone received one litre of soup, made of sauerkraut, rotten apples and sometimes dog meat. ‘When we return to the barracks in the afternoon and at night, we are always beaten a lot by the Ukrainians. We are never quick enough and allegedly not disciplined. When you receive a beating like that, usually a series of blows, you’re not very happy, and you continue to feel it for days’, says Schelvis. He also witnessed the execution of two Dutchmen who had tried to escape. 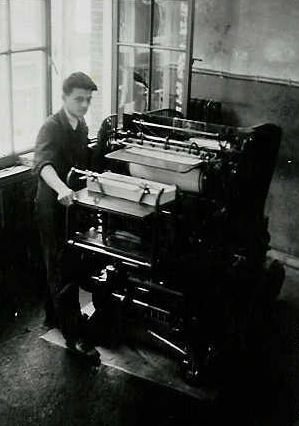 Together with another Dutch printer Schelvis applied for work in a print-shop outside the camp. But he and the group of men he was part of ultimately ended up in Lublin-Flugplatz, a labour camp a stone’s throw from the concentration and death camp of Lublin-Majdanek. There was no trace of a print-shop, but Schelvis did see men lugging heavy tree-trunks: ‘Emaciated people with death in their shoes passed us, spurred on by SS and Ukrainians with whips and sticks.’ Schelvis and the others from Dorohucza, including the Dutchman Jozef Wins, were forced to build barracks in the camp, among other things. After several days Schelvis and the other typographers were taken to Radom, west of Lublin. Radom was an actual Jewish ghetto, where part of the population worked as tailors. Conditions were good and Schelvis rarely saw any SS in the ghetto. Here were the printing presses and a typesetting machine that had survived the ghetto uprising in Warsaw intact. The machines had been disassembled and transported to Radom where Schelvis and the other printers first had to reassemble them. The relative calm in the ghetto was shattered on 8 November 1943, when the SS, the Grüne Polizei, and their Ukrainian helpers carried out a raid in the ghetto. Schelvis, who together with the other typographers was among those who were spared, saw it happen: ‘The sick who couldn’t walk were shot’. Children and old people were murdered also, while the others were taken away to the nearby Szkolna concentration camp to, as would Schelvis eventually, work in the weapons factory. When the Red Army advanced in the summer of 1944, the camp leaders were struck by indecision. ‘There was huge panic among the German leadership,’ Schelvis stated in 1947, ‘SS on the run from the front passed us and they didn’t know what to do, surrender or flee.’ The order of the Sicherheitsdienst to kill all Jews when the Russians approached, was ignored by the camp command. The prisoners were told to prepare to walk to Tomaszow-Mazowiecki, over one hundred kilometres to the west, where they arrived after four days of walking. Here they were locked up in a rayon factory and they survived on potato peel broth; they did not work. A short time later the prisoners were put on a train to Auschwitz, where a selection took place on the platform. Some women, who were sent to the ‘good’ side, stayed behind to work in the camp, while the men who had a lucky escape - Schelvis among them - were loaded back onto the train. Further west they went, and the train finally arrived in Vaihingen near Stuttgart, where Schelvis was liberated by the French army on 8 April 1945. On April 2016 Jules Schelvis died at age 95 in his residence Amstelveen.